Thank you, Marvel Studios. Thank you from the bottom of my geeky heart. Not only did they bring us one mega-blockbuster by way of the impressive Iron Man adaptation, but they managed to pull out the stops a second time with the very good Incredible Hulk reboot. Both movies were well acted, well scripted, and well directed. I thank Marvel Studios because they have the good sense to respect their properties and bring well thought out, faithful renditions to the silver screen. This last point is one that has always boggled my mind. Movie companies pay good money for the rights to make films based on established intellectual properties. Comic books are some of the most established properties available. Usually the characters are long standing and well developed, the property comes with a built in audience, and there's a million story arcs that have already been written to choose from. And somehow, despite having shelled out the money for the rights to this huge, rich back history, studios choose to ignore the canon, make it their own, and alienate fans. So going back to the thank you. Marvel Studios has begun piecing together the ultimate in fanboy geekiness. It began with Iron Man and was expanded upon in The Incredible Hulk. It will no doubt be of huge importance in the upcoming Thor, Captain America, and The Avengers movies. I speak, of course, of the Marvel Movie Universe. At long last, we have a series of movies starring our favorite comic book characters existing alongside one another within the same, cohesive world. Tony Stark and Bruce Banner exist together, they may hear of one another's exploits, catch glimpses of each other on the news, maybe even meet up in a future installment. This is such a no-brainer idea that I'm almost outraged that no one has capitalized on this until now. 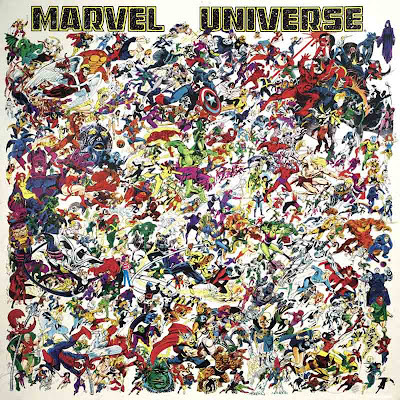 Across the various Marvel Comics titles, it has long been established that the various characters are all part of the same, larger world. Sure, such an undertaking might have involved a little extra scripting and few cameos here and there, but think of the sequel and cross-franchise potential. I can only imagine that some short-sighted Hollywood Big Wig felt that such an undertaking was too large and too costly for some lowly superhero flicks. Don't get me wrong, it's not that Hollywood hasn't churned out afew good superhero films. Both X-Men 2 and Spiderman 2 were great films. The distinction is we finally have a major player on the scene who is looking to expand and improve upon the conventions of the genre. You know, real progress. To my knowledge, a consistent world across several different movie series has never been realized before. This is a first for cinema. I applaud Marvel Studios for taking the leap and making history. P.S. I added Waldo of "Where's" fame into that picture above. If you find him, congrats. You have no life. Agree with the Geek? Comment below!